A girl is held captive, but she won’t give up easily. Held is a narrative lens test. The goal is to see if the performance of single focus adapters for anamorphic lenses influence the understanding and feel of the story. Gear specs below. Special Thanks to Ariana Saadat and Matt Leaf. It only took me six months to get this one off the page! Or four months if you consider when I published the technical comparison between them all as the last video of 2016. It took a lot of effort and planning. To begin I’d like to thank the great team of people that willingly went out on their last weekend of vacation to be a part of this. Tavia Cervi and Ben Clay, my stars, Renata Batistini, who was handling the camera, Keaton House, keeping my notes in order and handling the camera for some of the shots, Tyler Gilbert for production sound and for getting us all the locations, Natalia Peixoto for the blood administration and for helping out all around and lastly, Ariana Saadat who helped me greatly with pre-production, hanged around with us all day and gave me precious feedback afterwards. Again, just as “Intruder”, I was swapping taking lenses and single focus solutions all the time for the purpose of the test. The differences between each setup are more noticeable than the ones between the 1.33x adapters back then. If I am to break down exactly what draws attention to each of them, the FM Lens vignettes early with stopped down wider lenses but performs better when the taking lens is faster, the Rangefinder always has the blue flare when pointing at strong lights and shows lots of light streaking at fast stops, and the Rectilux plays unnoticed. Planning and testing the gear was key for staying sane with all of the lens swapping. I had three identical Kowa B&H’s set up, one with each single focus solution. All mounted to rail clamps so I could easily swap them on set. 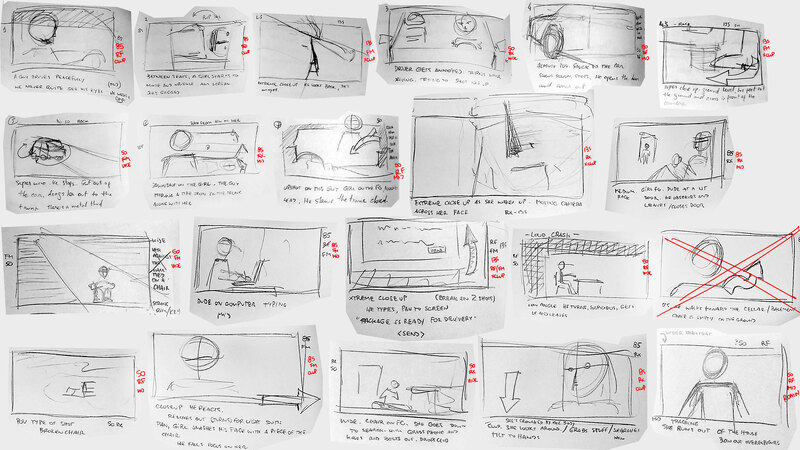 I also had detailed storyboards with notes of which combo should be used for which shot and we stuck to that, adding in a couple of unplanned shots. This way, we nailed the whole thing in seven hours of shooting, including a company move. The camera I used was the Sony A7s II, shot full frame at 4k (which ended up giving me tons of rolling shutter I never noticed before!) and had Reid’s EOSHD Pro Color sLog loaded up as my picture profile. For editing, I went with a 2.36:1 aspect ratio, the conventional Cinemascope. ONE of the shots (at 00:49) was the combination of FM and a 50mm taking lens, heavily stopped down. This yielded intense vignetting and I cropped that in post (+20% scale in all directions). Again, I’m going to the awesome João Gabriel Rodrigues for score. He’s been involved in all of my serious projects in the latest years and always does a great job. The goal of this test is to judge if the single focus solution affects the narrative either in a positive or negative fashion, or if, even with its flaws, the variable-strength diopter doesn’t stand in the way of story. How did you feel about it? Were you involved or just paying attention to edge sharpness, vignetting and flares? Leave a comment! If you wanna better judge the images, visit the blog and check the cheat sheet with all the specs for each shot. Lastly, if you like this type of test and subject, subscribe right away and consider supporting me on Patreon! Times are hard for an anamorphic lens tester and I could really use some help! I’m Tito Ferradans and I’ll see you next week.